The city of Tel Aviv was established in an area where Arab localities existed – particularly Jaffa and its suburbs in the south, but also smaller villages east and north of the city, whose names we still know today. The Arab localities in the Tel Aviv area, as well as their inhabitants, have been largely erased from the maps of the region and from its posted signs. While Hebrew-speakers still make use of the names Abu Kabir, Manshiyya, Summayl, Shaykh Muwannis and Salama, little is known about these places, and what is known is repressed. Tel Aviv has been at the vanguard in shaping Israeli-Jewish culture since the establishment of the state. That is why it is particularly important to recognize that Tel Aviv contains remnants of a history that existed before the city was built and before Israeli culture developed, and to remember what that culture incorporated. The traces of the Palestinian localities that were destroyed in 1948 continue to exist as a part of Israeli culture and of the landscape of the city. This map commemorates and honors them. The Arab villages of Tel Aviv are part of the city’s fabric and of its memory, as they should be. Like every city in the world, Tel Aviv also expands by constructing new buildings and tearing down the old. But this destruction must not be allowed to erase the memory of the city, which is part of the city’s culture and of the lives of its current residents, its former residents, and those who will live there in the future. This is an “ordinary” map of Tel Aviv, based on one issued by the Mapa – Mapping and Publishing Company, onto which we have superimposed the Arab villages that existed until 1948 and that still remain, in part, today. It also recounts the stories of these places through testimonies, historical and contemporary photographs, and scholarly research. The map highlights each of the villages and designates many of the buildings that, at least until recently, remained. This map is not intended to be a conclusive cartographic product: The mapping of the former villages and their placement on current maps has been carried out as exactly as possible by researchers who are not professional cartographers. Moreover, the borders of some of the Arab localities is subject to debate, because of their varying depiction in historical maps and the idiosyncratic way that these areas developed. Abu Kabir, for example, was usually depicted in historical maps as a neighborhood of Jaffa and not as a distinct village; it spread along the road to Jerusalem without any clearly defined central built-up area, and was composed of many scattered buildings, which makes determining its exact boundaries difficult. The boundaries of other villages have typically been drawn to include their agricultural lands, once again making it difficult to verify the expanse of the built-up areas of these villages. This map depicts the boundaries of the village centers, where their buildings stood, but with the understanding that their groves and other lands cover much larger areas. This map depicts the Tel Aviv area, excluding Jaffa . 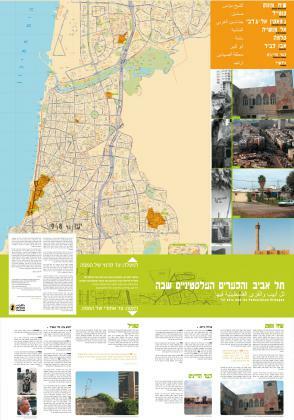 Abu Kabir and Manshiyya are included in this map even though they were part of Jaffa’s environs, because they were located in an area that became an integral part of Tel Aviv and, to a certain degree, became separate from Jaffa (cf. Sharon Rotbard, “White City, Black City,” Bavel, 2005). Portions of Salama, Shaykh Muwnnis, Jammasin al-Gharbi and Summayl still exist today thanks to the residents – called “trespassers” by the state’s legal establishment – who moved into the buildings where Palestinians had lived until 1948. Some of these Jewish residents themselves became refugees from other parts of the city due to the violent events of 1948, and some were refugees from other countries. They settled in the Arab villages with the approval of municipal and national institutions, and were later forced to leave, usually so that a university or a high-rise building could be built on the land. Today, with the support and encouragement of the Tel Aviv municipality, large construction firms are gnawing away at the remains of the villages. If this trend is not reversed, in another decade or two Tel Aviv’s children will believe, as in a painting by Nahum Gutman, that this city really was born out of the sand.